Charter Communications has been quietly operating a streaming-TV subscription service for at least the past couple of weeks, as first reported by HomeMedia Magazine. Called Spectrum TV Stream, the service offers up to 35 broadcast networks (the “big four,” plus local channels) in combination with either HBO or Showtime as part of its basic $13-per-month subscription tier. For those who find this offering too thin, there’s also a $20-per-month plan that adds more than a dozen cable channels to the mix, including A&E, ABC Family (or Freedom), AMC, Discovery, ESPN, HallMark, History, H2, HGTV, Food Network, FX, Lifetime, National Geographic, TBS and TLC. 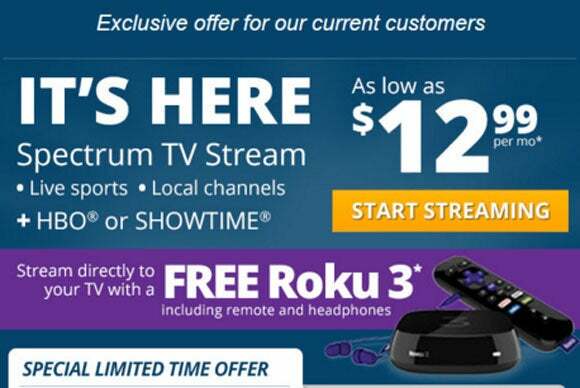 For a limited time, the company is even throwing in a free Roku 3 media streamer with each subscription. A $5 credit is applied to your monthly broadband bill to offset the upfront unit cost, a Charter rep told HomeMedia earlier this month. Charter is not alone in trying to reach out to cord cutters and cord nevers through a skinny combination of basic TV and a premium TV network. Comcast announced an Internet-TV offering along similar lines a couple of months back. Likewise, Time Warner Cable—the company Charter hopes to merge with before the end of the year—is rumored to have opted for the same content formula for its own streaming product. Why this matters: Cable companies are beginning to see the writing on the wall: That if they continue to be mere spectators to cord-cutting’s rapid advance, they could be left with little or no say in TV’s largely online future. They seem convinced that the way to cord cutters’ hearts is through their Internet connections. There are a couple of important things you must consider before you begin to think about subscribing to the service (assuming it’s available in your area). First, it’s available only to the company’s broadband-only subscribers. Second, the above mentioned prices are exclusive of “taxes, fees and surcharges.” According to some users over at the DSL Report forum and Slickdeals, these miscellaneous charges can add an additional $5 to $6 to your monthly bill (the actual amount may vary depending on your location).